The vocal group Culture is Joseph Hill (1949-2006), Albert "Randolph" Walker and Kenneth Paley. This set was produced and arranged by Joe Gibbs and Errol Thompson (aka The Mighty Two). It is considered a classic. Joseph Hill was considered a copyst of Burning Spear. I don't think this is true because The Spear has a peak even in his worst album. This doesn't mean that this a bad set but only that it is nothing more than a Culture album: well performed and produced. The title refers to an old Jewish interpretation of the Old Testament in which the number 7 is referred to the Apocalypse. In 1977, when two sevens clash, the world would have come to an end. On 7 July 1977 Jamaica people stayed at home, literally. Maybe this 1978 set from Culture can be considered a classic if considering their music. Someone thinks that it is a classic inside a wider view. This should be discussed. In any case this is one of the best set from them indeed. The usual hypnotic rural Roots mood is delivered as usual and the ten songs flow cool and chilling out more than ever. Don't expect something different from"Cumbolo". Culture guarantees one kind of quality and that it is. 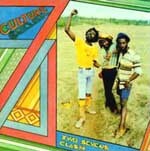 Generally I think that a lot of material from Culture resembles some from Burning Spear. That hypnotic wave is often present in both, even if of course there are many differences too. As stated elsewhere for Culture the album is quite flat without paticulars peaks. But without any doubts here they moved a step foreward than the acclaimed "Two Sevens Clash". This album was produced by Sonia Pottinger. The opening years 1977 /1979 were the most interesting for Culture. This album, along with "Two Sevens Clash", "Harder Than The Rest" and "International Herb" represent one of the peaks for a group that from my point of view never had a proper peak track in their sets. The debut "Two Sevens Clash" for Joe Gibbs set some sort of standard. But the two other sets plus this one for Sonia Pottinger were certainly more developed and mature. Culture stlyle had been often compared to that from Burning Spear. There are some similarities for sure but Joseph Hill's lyrics were sometimes quite richer. This remains a classic from Culture. This album was produced by the great Sonia Pottinger and recorded at Treasure Isle Studios and engineered by Errol Brown. The backing band are The Revolutionaries playing perfectly. This should say something. But the mood is Culture's which means the usual under tone vibes. I am not a big fan of Culture for the fact that they sound a little bit too much soft and dull. From time to time they sound like some lazy Burning Spear tune. The title track is a very happy one with its ode to ganja and it appears like a track from somebody else. All the rest sounds like the same song repeated forever and it is really difficult to find a peak inside the album. Maybe this ipnotic approach is the trademark of Culture and they should be appreciated for this reason. Please refer to the Don Carlos' page for my comments on "Roots & Culture".